Custom fields are additional fields you can create in Mambu in order to capture any additional information required as per your business processes. If you want to capture, for instance, the number of children in the clients' household, the funds source for a specific loan or the managers of a branch ,you could create custom fields to add this information to, respectively, the clients, accounts or branches profile. Custom Fields for Loan or Savings accounts can be specific per product. Custom Fields for Clients and Groups can be specific per client/ group type. Custom field sets allows grouping the fields shown in different screens in a logical manner, to match the structure in your paper forms and thus facilitate data entry when a new client or loan account is created by users. Each custom field set is visually separated on the screen to help easily identify those information fields that are linked to each other and therefore entered together. To create a new custom field set, go to Administration > Fields > select a category (Clients, Loans, Deposits etc.) > click on the green “PLUS” button. The custom field category (Clients, Loan Accounts, etc.) determines to which “entity” the fields will be attached and, therefore, where they will be displayed. For example, “Client” custom fields will be displayed when creating a New Client and when viewing an existing client’s details. There are two types of Custom Field Sets. Standard: Each field in standard sets can be added only once for a single entity (client, loan account etc.). i.e. you can only have one value stored for the different fields in this set. Grouped: multiple values can be added for the fields in such sets, and they will be displayed as a subgroup within the set itself. To add a new bank account, the user would click on “Add Bank Information” button and a new empty sub-set containing the 4 required fields will be added. Once you have more than one Set for a given object, it is possible to re-arrange them in the order that you want them to appear when creating/editing the object, to do so click on the "list" icon besides the Set's name, then drag and drop each set in your preferred order. To rename or change the notes for an existing Set click the "Pencil" button, fill the details and save. Only sets that contain no data in their Custom Fields can be deleted. To do so click on the red "minus" button, then confirm. If a grouped custom field set contains one or more required (mandatory) fields, Mambu will automatically add the whole sub-set when a new entity (client or account) is created. Custom fields in grouped sets can’t yet be used in custom views or edited directly in the “Overview” or “Details” screens or added with the “Add Custom Field” option. The only way to add or update custom fields in grouped sets is through editing the entity (client, loan account etc.). Click on the appropriate tab for the object for this custom field. Fields are available for clients, groups, loan accounts, guarantors, guarantee assets, deposit accounts, branches, centres and users. Select a Custom Field Set for the field. Fill in the Name, Type, Display, Usage, Edit Rights sections (Described below). It is not necessary to type and ID for the custom field, Mambu can create and ID for you based on the type and name of the Custom Field. Each Custom Field should always belong to a set, if there are no sets it is necessary to first create one before creating any custom fields (except for Guarantors and Asset fields, which have no sets). Client custom fields can also be created separately for each Client Type and Loan & Deposit Accounts custom fields can be created separately for each Loan or Deposit Product. This is very useful when the information collected in the client registration forms or the loan application forms is different depending on the type of client or loan. This option allows the user interface to display fields in a better way when the field content is long. However, it doesn't change the length in characters a field can have, which is 2048 characters. 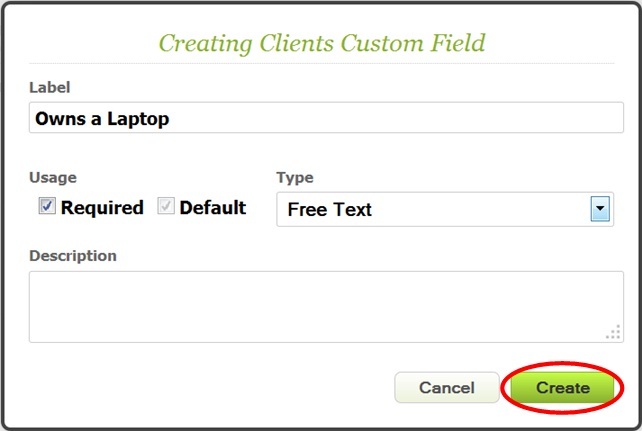 With a free text custom field, you can manually enter the value of a specific field. Suppose there is a custom field about the number of children in the household of the type free text. When entering this information in the clients' profile you will need to enter the number in the correspondent textbox. A field with format ###@@@ will only accept values using that pattern, in this case 3 numbers followed by 3 letters. For example 123abc. This option will allow you to create custom fields with predefined options which can be selected just by clicking on them. Use this type of custom field when you want to provide a set of predefined options that other users can then select from the list. Suppose you need to capture information about the loans' source of funds. Using a pre-defined selection field would allow you to enter different options, such as Local NGO, Individual Lender and so on. Use the arrows to move the options up or down according to the order you want them to be displayed. A Dependent Custom Field is a special type of Selection Custom Field. The values available for selection for this type of field depend on the value previously selected on another custom field - the Parent Field (hence the name Dependent). For example, imagine a field called "Country" that has 2 selections: Poland and Greece. There could be a dependent custom field called "City" which has options "Warsaw" and "Krakow" when Poland is selected, then "Athens" and "Mykonos" if Greece is selected. The Dependent custom fields automatically use the Parent Field usage settings (available/required/default). 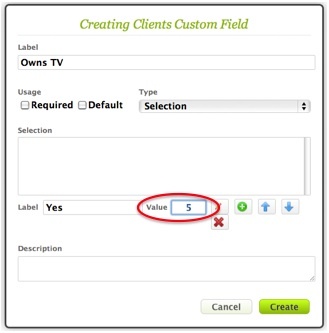 Parent Custom Fields must always be arranged before their dependent custom fields in the Custom Field order. You can associate numeric values to each of the options available for Selection custom fields, including Dependent custom fields. When the different values are selected for fields with scores the numeric value will be displayed alongside the selection, and the total sum of the selections for each set will be displayed as well. The values of the scores can be used, for instance, to calculate social performance indicators for your clients. If the information you want to capture is purely with numbers, e.g. the number of children in the household, the numeric custom fields would be the most appropriate. Choosing this type of custom field will make sure that only numbers can be entered and help preventing mistakes. If you want to create a custom field for which the only two possible answers will be "yes" or "no", you can use the Checkbox type. You can then for instance create checkbox custom fields for Loan accounts to generate a checklist of requirements needed for the approval process, such as Business data collected (yes/no), House inspected (yes/no), etc. This type of field will allow you to store a date, similar to how you store the birthdate or ID validity date of a client. Example usage of this might include: tracking of a first contact with a credit officer until creation in the system, having the end dates of mortgages not tracked in Mambu itself or any relevant date. 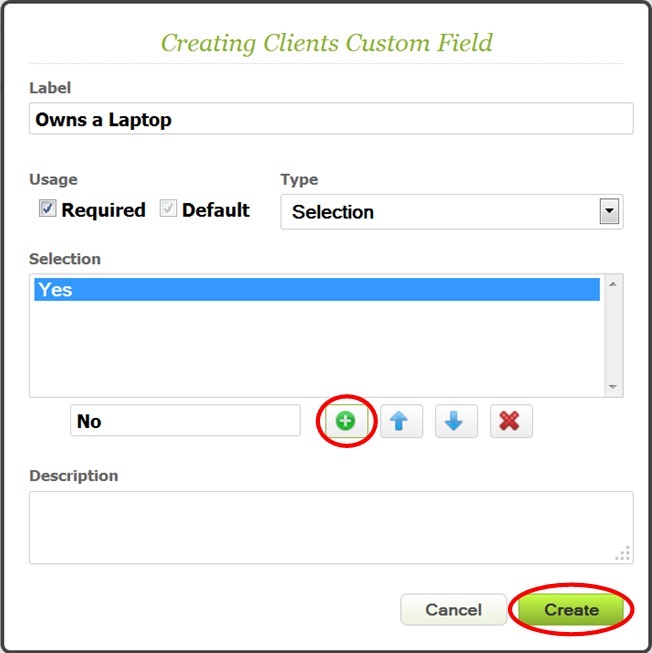 These custom field types allow for the selection of a client/ group / Mambu user that is already created in the system. The field allows searching for any existing clients / groups / Mambu users by name or ID. For Client, Group, Loan and Deposit account types of fields you can decide for which Client types, Group types, Loan or Deposit products you want this field to be displayed. For instance, you might want to have a Client custom field be available for External client types, but not for your Employee type of clients. If you set a custom field as Default, it will be displayed as an option that you can choose to enter information or not. The custom fields that are not set as Required or as Default will only appear in the form if you click Add Custom Field. You should set a custom field as Required for the information you want to capture for all your clients. When you or any staff member creates or edits a client in Mambu, the form will only be saved if all the required fields are filled. In this section you can define which user roles will have the right to edit the custom field. If a role is not selected then the data of the field will not be editable by users belonging to that role. This allows more control on which resources in the organization are able to add or modify each field separately. If a field is required any user creating the object has to belong to a role that has edit rights to that field, otherwise the object cannot be created by any user with that role. The custom fields order in General Settings will be the same in the clients profiles, accounts or branches forms. If you need to rearrange the order in a way that reflects your operational needs. For dependent Custom Fields, the dependent field must always be after the parent field in the order. The custom fields you create will also be available as placeholders which you can include in your contracts, statements or receipts. If, for instance, you create a custom field for Occupation and want to include that information in the client's contract, when creating the contract's template you will be able to choose the placeholder Occupation from the list and the information will be automatically filled when the contract is printed for a specific client. To see more details on how to use the placeholders in contracts' templates, have a look at the article Contracts, Receipts and Statements.